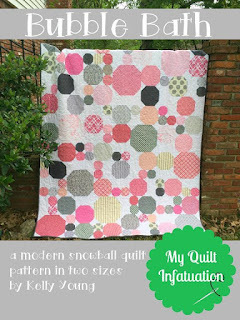 My Quilt Infatuation: Black Friday/Cyber Monday HUGE Deals and Giveaways! Black Friday/Cyber Monday HUGE Deals and Giveaways! Happy Thanksgiving week, y'all! You may have noticed that I didn't have my usual mid-month sale post this month. I figured that since the biggest shopping days of the year begin this weekend and continue through Christmas, I would forego my regular posts in November and December, and just make one giant holiday sale post to fill you in on all of the latest happenings at my favorite shops. So, before you enjoy your Turkey Day, take note of these great deals and get ready. Scheme and dream, load up your shopping carts, and gift yourself some fabric love. Or you know, you could plan to purchase the things you'll need to finish up those holiday gifts (which sounds much less selfish if you really need an excuse). And yes- this post has giveaways as well- THREE of them, so don't miss out! I'll kick off this post by offering the first of the giveaways, and this one is from me. I am giving away a pdf pattern of choice to two readers. Bubble Bath and Pop Star are a couple of my more recent favorites, but I have 17 different patterns to choose from. My patterns range from very easy to more difficult, and all of them have super-detailed instructions, including cutting diagrams and full color illustrations. Several of my patterns have an illusion of curves, but all have simple straight piecing. Most are written in a variety of sizes as well, so you're sure to find one to fit your needs, to help you make a special quilt as a gift or for yourself. You can check them out in my Craftsy shop HERE, or my Etsy shop HERE! If you need a really fast gift and don't have time to make a quilt yourself, I do have one quilt in my Etsy shop for sale as well (this will be my only quilt listed before Christmas!). My Truffles quilt has fresh shades of aqua, red, and gray and a fun, modern pattern. It is a versatile throw size, and you can see it HERE! Up next is Fat Quarter Shop. Here's the thing with FQS- they are having some amazing sales for Black Friday, and separate awesome deals for Cyber Monday, but I'm not allowed to share them with you. Fat Quarter Shop likes to keep their sales confidential until they are live. Since I'll be enjoying Thanksgiving with my family, and this will be my one and only post until next week; I won't get the opportunity to share the specific details of these sales with you (and yes, I DO know what they are). All I can say is definitely check them out on those days. You won't be sorry! The next shop is where I designed and purchased one of my favorite additions to my quilts- my labels! They are high-quality, color printed, custom labels that are so easy to sew right into the binding of your quilts, adding the perfect professional touch! Since I've shown my own labels a few times (you can see them HERE if you've missed it), I want to take this opportunity to feature the labels from someone else who has designed some for herself- Jess from Quilty Habit! Aren't they fabulous? Jess and I each ordered THESE labels in the 2.25" width and had them printed side to side, rather than running the length of the ribbon (these details are important). No worries, though! Peter at Finer Ribbon will guide you through the process, and they will even send you a paper proof that is perfectly to scale so that you can print it out, fold it, and be absolutely sure you're getting what you want. Finer Ribbon has extended their 15% off coupon with the code MQI15. It's hard to beat a spool of 1000 labels for that price, friends! The next shop on my list happens to be sponsoring the second giveaway! 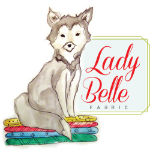 Lady Belle Fabric is always one of my favorite places to shop, and they are certainly rewarding their customers this holiday season. 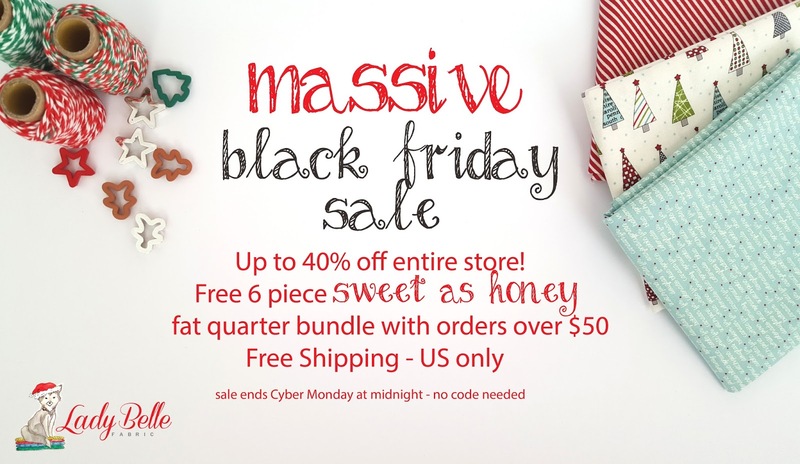 The entire store will be on sale up to 40% off, with a FREE Sweet As Honey six-piece FQ bundle with orders over $50! Lady Belle Fabrics is also giving away a jelly roll of V and Co.'s Simply Colorful collection. One lucky reader will get to choose her three favorite color ways. That's going to be a tough decision, because they are all so lovely and vibrant! Fabric Tree is up next, and though they are a shop that is a little smaller, their fabrics are beautiful, and their customer service is impeccable. They have precuts, bundles, and yardage, and they have some really adorable collections. Fabric Tree's entire shop will be discounted, with yardage 20% off. Notions, patterns, and precuts will be 15% off; and the best part is that this sale will extend until the new year. 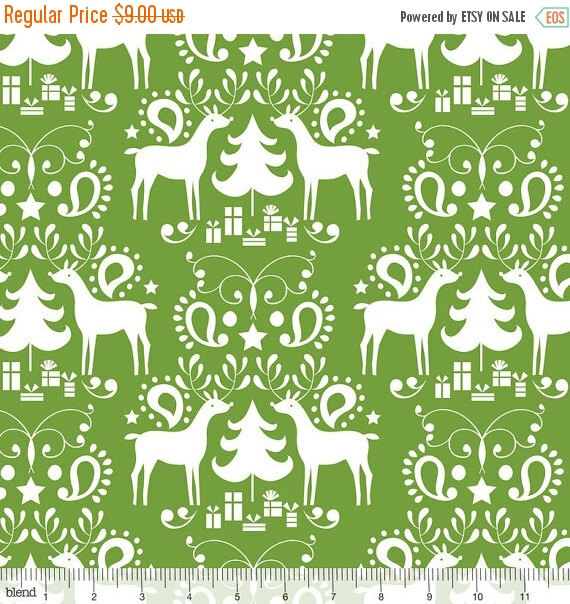 I think I might have to get some of this fun Christmas fabric before it runs out! At Shabby Fabrics, they're making Christmas shopping as easy as 1, 2, 3, 4! So fun! The sale will run through the weekend, so don't miss out! 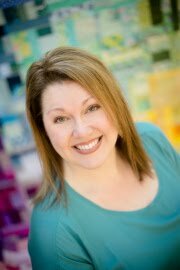 Last, but certainly not least is Fort Worth Fabric Studio, and wow! They certainly have some great things happening this week! Today through Thursday 11/26, all Moda fabrics are 15-25% off. You don't need a special code. The sale prices will be reflected in your shopping cart. On Black Friday and Saturday, all Riley Blake & Michael Miller fabrics will be 15-25% off. Again, no code needed; the sale prices will be reflected in the shopping cart. They are also having a Treasure Hunt every day this week through Saturday! Each day will feature 5 NEW treasure hunt items. Just look through the shop for the items with a gold star like the one on the right. These items will be on sale at an exceptional price for one day only! You will love what they have selected for the treasure hunt - a sampling of new goods, basics, precuts, best-sellers, and more! 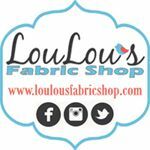 Fort Worth Fabric studio is also sponsoring the final giveaway of the day! 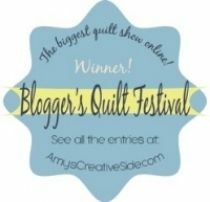 They are generously giving away a Glisten fat quarter bundle. These beautiful, rich Christmas fabrics are just timeless and would look amazing in any Christmas project! Okay, friends! Entering all three of these fun giveaways is easy peasy. Just leave a comment on this post to let me know what goodies you're scheming and dreaming about. Please be sure you leave an email address so that I can contact you if you are a no-reply blogger! 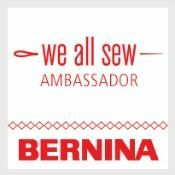 I'll announce the winners at our next Needle and Thread Thursday (12/3). Good luck to all, happy shopping, and Happy Thanksgiving! Well I love all your patterns but if I was dreaming about a quilt to make, it would definitely be Bubble bath. Great for a baby with either pink or blue bubbles. Wow...that's a great list of giveaways and sales. I think I'm dreaming about the Finer Ribbon labels. In desperate need of a Bubble Bath! Lovely patterns-hard to decide which I like best! May have to try both after I finish up some UFOs! I like Pop Star! I am trying to finish up a quilt to give as a Christmas gift, binding next! So many great tempting items. I have a few items for me on my holiday list and I am sure I will be picking them up this weekend. Thanks for sharing the sales! I love the bubble bath pattern and color scheme!!! So pretty! I love the jelly rolls. Thanks for the giveaway. I'm dreaming of adding a serger to the mix, but since I just got a new machine this year I think a serger class is more likely. I would love to know what the deals are with FQS, is Friday better or Monday? I have my eye on the Blueberry Park jelly rolls, I love jelly rolls! I dreaming of fabric for a quilt for me! I'm dreaming of finishing the quilt I'm working on. It's the first quilt for myself that I can use as a quilt, rather than put on the wall or on a table. 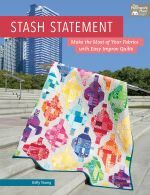 I totally have my eye on a jelly roll of Simply Colorful II! I indulged on a impulse purchase and bought a charm pack of it already. Thanks! Those ribbon labels are very enticing too. I am scheming for more fabric and thread. 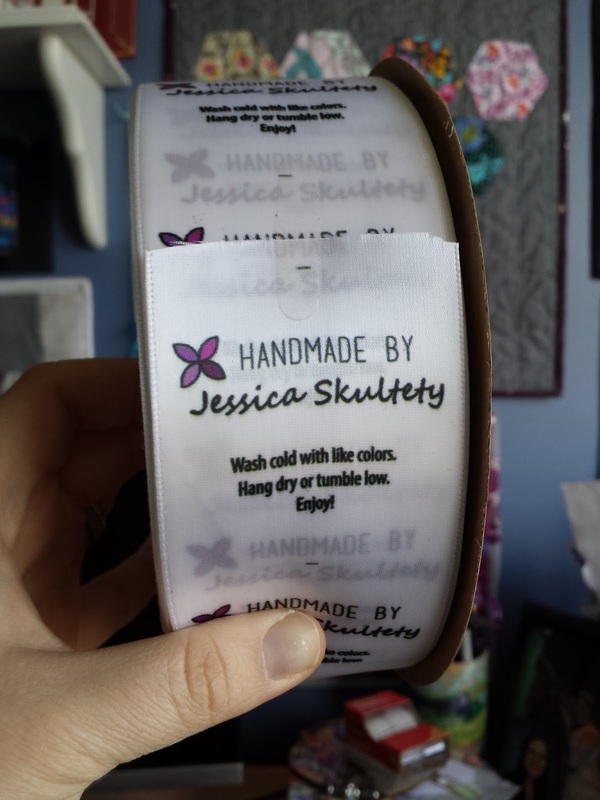 Jessica's labels..........I must start labeling my quilts and other quilted/sewn items. What a tantalizing post! I am really looking forward to whatever surprise FQS has and also Lady Belle's fantastic sale. Shabby Fabrics is keeping it interesting, too! But what I'd really love is to win a pattern - Courtyard Tiles and Acadian Trellis are on my Craftsy wishlist! I can't wait to see what FQ shop has in store for us. I love all fabrics especially ones that are on sale, LOL I don't have anything particular in mind, but you know how it goes-when you see it you'll know!! Happy Thanksgiving. There are some wonderful give aways there! You have outdone yourself for sure! This year, I would love to find a new-to-me sewing machine under the tree. It doesn't have to be brand spankin' new, just have be in good running shape and have a variety of stitches, such as a zig zag and straight stitch. I have a gift certificate for FQS, I can hardly wait for the sales to spend it. I love the Simply Colorful jelly rolls. I am dreaming about the Simply Colorful Collection, they are all so beautiful. I think I would like to have some Jingle! LOOOOVE your Bubbles pattern!! Would love to get that..& Labels...& always "Neeeed" more Fabrics!! giggle.... I have shopped at Fat Quarter Shop & Fort Worth...love em both! I love those Jelly Rolls and I do love patterns of course but can one be picky if something is free? I am scheming and dreaming about all of that beautiful Christmas fabric. I love Christmas fabric! Thanks! What a fantastic list! I'm scheming and dreaming of fabric. So many fantastic lines out there! The Simply Colorful jelly roll is my favorite, fingers crossed. Those V & Co jelly rolls look yummy! Thanks to all your sponsors. Wow, fanatastic news.I`d love the Christmas bundle.Thanks! Love those jelly rolls! what awesome colors! One of these days I want to get the labels for my business, just can't afford them right now! Oh my goodness, so much to love about this post! I've been pretty busy with my etsy shop lately (I make quilted Rummy Royal/Tripoley mats and quiet books), and my three kids. I'm already looking forward to January when I can (hopefully) sew whatever I want with whatever fabric I love! 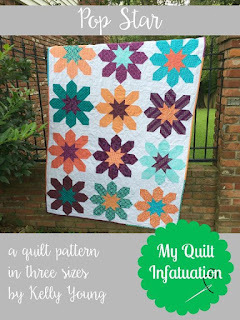 Love your quilt patterns! Those jelly rolls from Lady Bella look delicious!! Wow, such a great list. Could spend all day putting together dreams of fabric and patterns, but will spend it making to "mail". What I'd really love is some of those lovely labels. Best I've seen. Thanks for telling us about them. The pattern choices and both of the fabric lines are all so very nice. It would be a delight to win either one of the three. Thank you for the chance! I am dreaming of the new Art Gallery Wonderland collection. Love it! Thank you Kelley, and sponsors. Happy Thankgiving! I am dreaming about having more time to quilt. I barely got anything done this year and I made a promise to myself that I couldn't start anything new until at least half of my UFOs are completed. Sigh... Thanks to you and your sponsors for the awesome giveaways! This my be just the push I need to get motivated, I so want to start something new. Happy Thanksgiving to you! I have really admired your Bubble Bath pattern, both for choice of fabric and lovely layout! And the V & Co. Simply Colorful fabric is yummy. It's hard to choose... but I'd love to make the Bubble Bath quilt! Hi Kelly! Thanks a lot for the giveaways. I like your patterns a lot so I´m dreaming of one of your patterns :O). I am dreaming of some Aurifil thread. Seems like I never have enough. 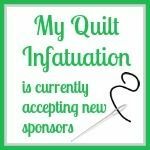 I'm dreaming of new fabric, Aurifil thread, and new patterns.all of your prizes look great, thank you and your sponsors for the great giveaways. Happy Thanksgiving! Thanks for the chance! Those mini jelly rolls are perfect for baby quilts. I'm all about cones of Aurifil thread, though. My first one is coming for Christmas this year! Have a wonderful Thanksgiving! I love Christmas fabrics. One of these days I'll actually have a new Christmas quilt for Christmas. Happy Thanksgiving!! I really love precuts - the mini jelly rolls are great!! I'm dreaming about the new fabrics from Zen Chic. They are on the top of a long list of fabric wishes! Thanks for sharing this great information and for the chance to win. Have a wonderful Thanksgiving! Oh my goodness! I love precuts...oh who am I kidding I just love fabric. 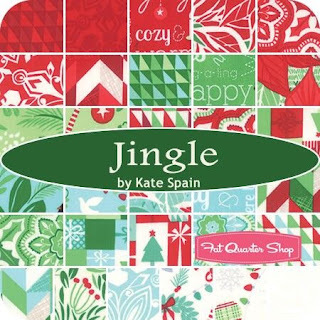 I'm loving the Jingle Fabric Collection by Kate Spain. Wow! So generous! I'm always scheming and dreaming about fabric...at the top of my list at the moment is blueberry park fabric. caraleesearl at yahoo dot com. What a generous group of giveaways! I'm dreaming of getting more of my ufos done. Then I might be able to start some new projects with lovely new fabrics. 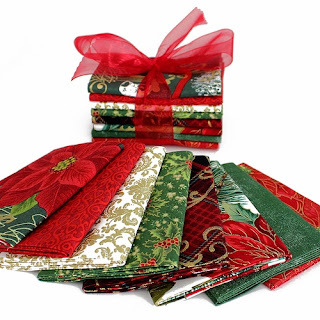 I love the Christmas fat quarter bundle by Fort Worth Fabric Studio. Thank you for the information and the giveaway. 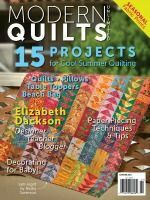 i'm wanting some fq bundles, some great new quilting books...oh and maybe some new threads. Wow, so many great choices. I caved and placed an order with LadyBelle today to get fabric for my sweet daughter's quilt. Can't wait and here's to hoping for more fabric!!! I love the Bubble Bath pattern! A wonderful group of sales and free treasures. Love the labels. Can't wait to sew. What an amazing giveaway. Everything is so lovely. I dream that a cleaning fairy will come to my house so I can have more time to sew. Thanks for the great giveaway. Treasures, all of it. I am about to undertake making Fidget Quilts to use up a lifetime of saved goodies. I promised myself I would not buy anything extra. I didn't promise myself that winning some goodies would not be allowed. 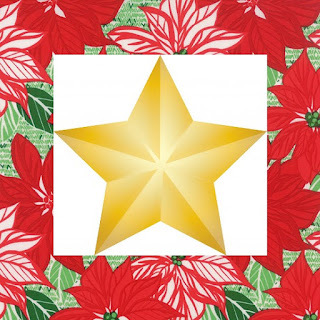 I love Christmas fabrics and the Glisten fat quarter bundle really looks like super fun to create with. I already have a project that I think would be perfect for this bundle. Gosh there are so many things to dream about having, wanting, wishing for. One can get overwhelmed but I was cruising the Caribbean during the Black Friday sales, looking at turquoise waters so I missed them. I got some great deals at Lady Belle Fabrics, I wouldn't mind another jelly roll of V and Co., the new colors are so pretty! Great giveaway, thanks! Thread packs! And thanks for all the good tips! I have too many projects to pick just one. I love truffles, pop star, and paper doll dress up. 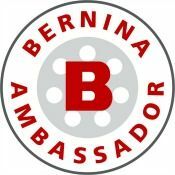 Thanks for the give-a-way and the sales info. I still need to get some labels. Now might be the time. Lots of fun things to shop for....I really like the custom labels. Thanks for the info on that. Bubble Bath looks like so much fun make!